How can you identify which educators will be on board with edtech programs at your school? In this Talking Ed video, Tony will discuss how to identify the early adopters at your school and what you can do to convince reluctant teachers to get on board. Hi and welcome to another whiteboard session with myself, Tony Skauge, the services program manager here at Edmentum. For this session in particular, we're going to explore how to find your early adopters when you're working to implement new pieces of instructional technology into your classroom. Let's start by thinking about this from a group perspective. What we have here is a series of five different subsets of individuals that might be at your school or your district, that you're working to help trying to influence as you're working to implement more, whether it's instructional technology tools or just new strategies for teaching. Let’s start with the different groups. The first group going left to right is our innovators group. The innovators group, if I'm thinking about descriptions, this group is really focused on being very, very social. These are your groups of individuals who are really willing to take new chances and really looking for creative ways to take instruction in the classroom to different levels. Now, if we continue to move to the right, the next group here is our early adopters. 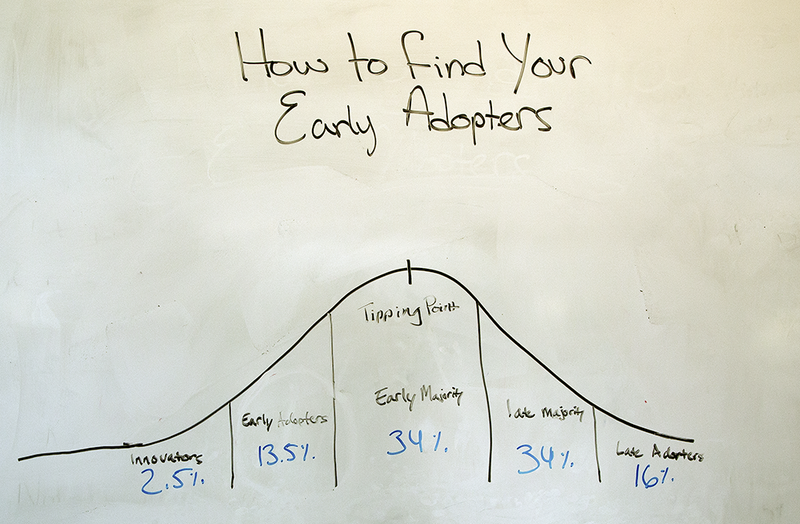 The early adopters sometimes are classified as almost like a high social status. Really what that means is this can be your veteran group. This can be your group of teachers who have been around the block. They know what's going on, and they want to continue to improve their practice. This is a great group of individuals to work with, simply because they're typically open to really new and creative ideas. Then, you've got your early majority, right here in the middle. This early majority can be described as folks who are very influenced, in most cases, by the early adopters and by the innovators—and when thinking about new processes or practices are really open to trying to new things, provided they might not be the first one to do it. They want to see somebody else do it before they go through and start to implement it into their own classroom. The next one over here is the late majority. This is a group that I would call in a word, skeptical. This is a group that is very open to trying new things, provided they have some evidence to support that process or practice. They're not exactly the first to jump on the wagon, but they're willing to listen. They really have to be able to see it being done. This is that group—“this too shall pass” group—the group that's saying: "It'll come and go. It won't be there forever." The last group here, the late adopters—these are the folks in most cases that I list as being averse to change. These are the groups who are saying: "You know what? I've been doing it this way for 25 years or for 5 years, and I don't have any intentions of changing it." When you start to think about how you approach these groups—and I really sat down and thought: "OK, how would you approach a group of individuals like this to try to move some of this late majority over as you're trying to implement some new strategies"—I really started to think a little bit about me, myself. This is where I would've fallen in the group. When I first started teaching, I think I would've fallen right into this early majority. My first year of teaching, as with most folks who are probably listening in their first year of teaching, you are treading water. You are trying to keep your head above water and do the best you possibly can. The thought of trying to incorporate new processes and practices or technology into the classroom—while it's very attractive and appealing—can also feel a bit overwhelming. But, I was fortunate in the sense that I had an opportunity to work with a variety of teachers who were not only innovative but were also qualified as early adopters. I really got to sit and watch these folks go through and utilize elements of instructional technology in their classroom day in and day out. When I started to see more of the results and started to understand how these instructional technology tools could really make a huge impact on not only my practice as an educator but, more importantly, on how my student outcomes were being driven, I quickly went over here to the early adopters phase. One tip, trick, or technique as you're working with groups that might fell in this late majority or in this late adopters is to really work to help them understand that implementing new technology processes and practices is a part of an ongoing cycle, part of ongoing change. While it might be difficult to go through and do this, partnering these folks up with somebody over here with a high social status or with an early adopter can really help to move those folks from here over to here. Thinking about this group, this is not a fixed number. You might be thinking about your district. As I'm talking about this, I'm sure you're thinking about folks in your specific school that fall in these categories, but these are not fixed. These are malleable, and they can change year over year as staff move. The more technology that becomes prevalent in your classrooms or on your sites, the more folks you're going to have moving over to this side. Try to critically think when you're working with your staff and understanding how to roll out a new process, practice, or instructional technology piece: “How could I really make sure that everybody that is either in this early majority or over to the right get an opportunity to work collaboratively with folks who are much more willing to try some things different and new to increase student outcomes overall?” The more you can really think about this and having that end in mind to begin with, the more you're going to have success when you're implementing new processes and practices. Thank you again for your time today, and we look forward to seeing you in a future Edmentum whiteboard session.